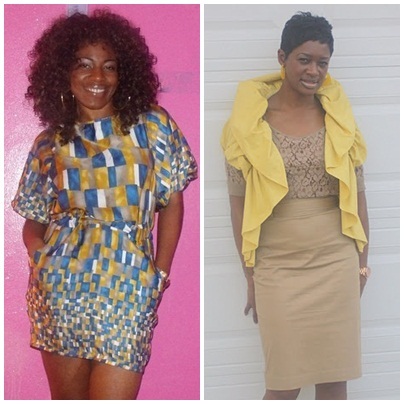 D. L. Winfrey Founder of Pretty Girls Rock Dresses LLC. Image courtesy of Tanisha Rankins. This week's So Stylish Spotlight is D.L. 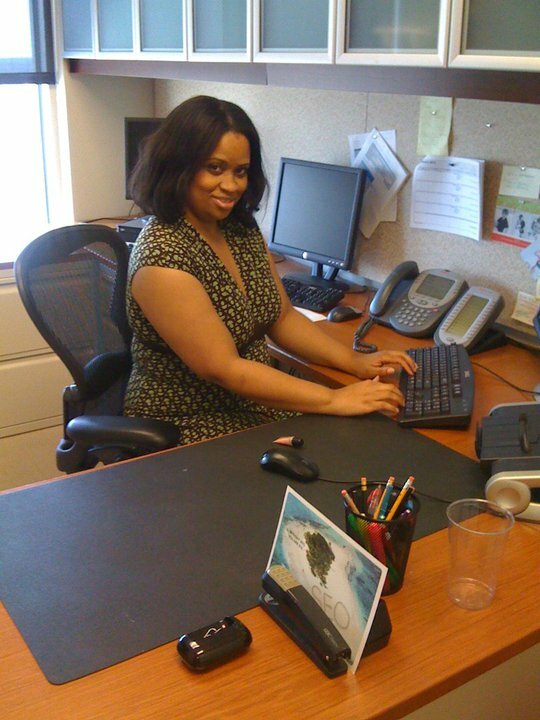 Winfrey the founder of Pretty Girls Rock Dresses LLC (PGRDresses) headquartered in Atlanta, GA. What started as a facebook group's "DRESS" challenge, where participants committed to wearing dresses at least 3x per week, has turned into an international movement to encourage women to embrace their femininity. I was so impressed with what she was doing that I eventually reached out to her and asked if she could collaborate with me on Operation Prom Atlanta and Swapnista. She said yes and we hit it off immediately. Could it be that we are sorority sisters or that we share the same birthday? What ever the reason, she is an amazing person, with a genuine heart and a woman of her word. I credit the PGRDresses challenge for inspiring my blog and strengthening my love for always dressing like a lady. Hope you enjoy our interview. Tell us about Pretty Girls Rock Dresses. 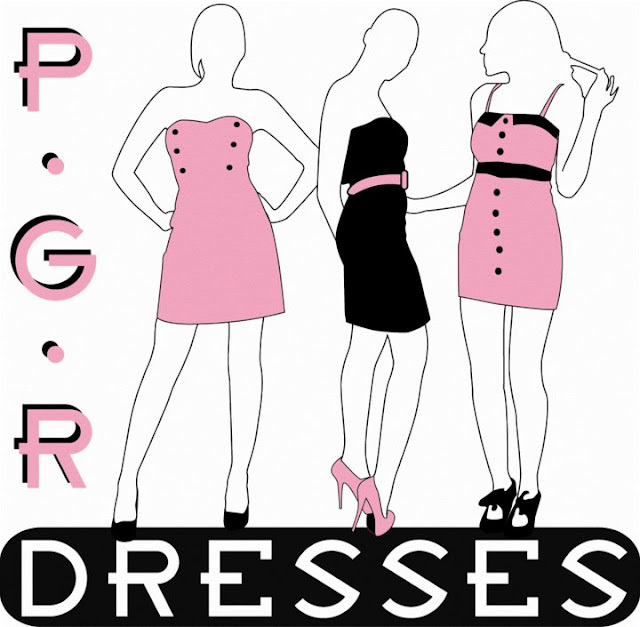 PGRDresses started off as a joke between some friends on Monday, January 17, 2011. We were talking about men's fashion and how they should dress better. I suggested that maybe if women would dress better men would follow "suit". So we came up with a dress challenge. We would wear dresses/skirts at least 3 days a week. Our little challenge went viral; it spoke to the inner goddess of so many women. It's amazing how a play of words have changed so many lives including my own. What has been the driving motivation behind PGRDresses? Empowering women and girls to embrace prettiness both inside and out. PGRDresses has an amazing platform to reach so many people. Our society focuses so much on negativity; our goal is to provide an outlet that celebrates beauty, charm, class, and all things that embody womanhood. PGRDresses Event in New York at Tracey Reese Boutique. Image courtesy of Centric. How would you describe the impact that your organization made for women in the community? We have touched so many people nationally and internationally. It's amazing really; our organization is open to all women and girls (no matter race, age, class, or political affiliation). We also have a division called Pretty Dapper for the pretty cool men who are doing good in the community and who love pretty girls. We provide daily tips on how to have and lead a pretty cool life. We are the ultimate lifestyle organization. There's nothing more powerful than a woman understanding and celebrating her womanhood. We have different chapters around the country with more opening in 2012. It's exciting to know that our blog full of inspire, our "PRETTY DEEDS" service projects have touched so many lives not only in Atlanta but across the country. I am so PROUD!. Founder D.L. 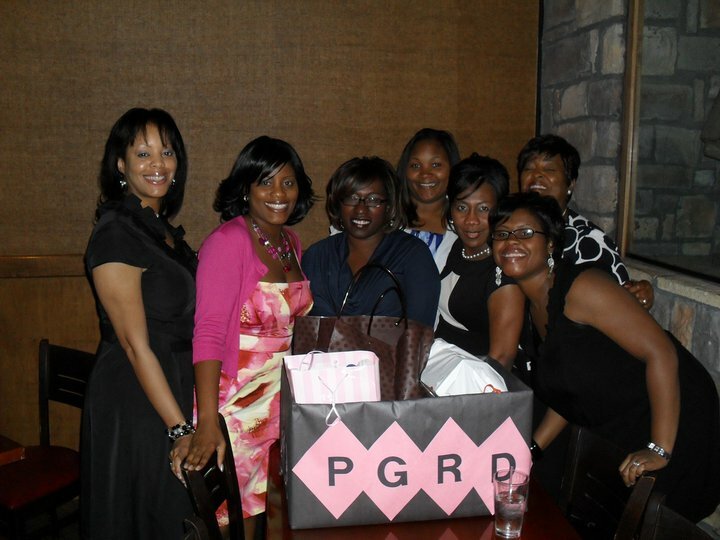 Winfrey (holding gift bag) with a few Pretty Ladies of PRGDresses Atlanta. As you reflect on your almost one year of your initiative, what are you most proud of? Wow that is so hard. We have done so much over the course of the year. I am most proud of the grass roots activism. We have provided dresses, shoes, accessories, toiletries, and can goods to so many people in several different cities. I am proud of all of the small business networking we have done over the past year. I have gotten a chance to meet some pretty AWESOME people. The biggest accomplishment so far is gaining our TRADEMARK. Who would have thought our little challenge would evolve into an organization that empowers let long having our very own INTELLECTUAL PROPERTY? Who would have thought that PGRDresses would be a major fixture of my life and the lives of so many people? It's truly a blessing that I don't take lightly! PGRDresses Memphis collects donations for a local women's shelter. Image courtesy of Tanisha Rankins. My biggest challenge has been trying to decipher which initiatives to pursue. Attempting to put together a firm foundation in such an open way. PGRDresses looks premeditated our timing has been amazing; but it's the opposite. We had and have a lot of things to take care of to ensure a successful organization and at times it's been very STRESSFUL. We had to slow down and create a vision and a path for PGRDresses. I have a great team of advisors and we are really paving a way for the ultimate pretty organization. Also, trying to balance my career, personal life, and PGRDressss has left me a little burnt out. I feel like I'm chasing my destiny and how can I stop running? 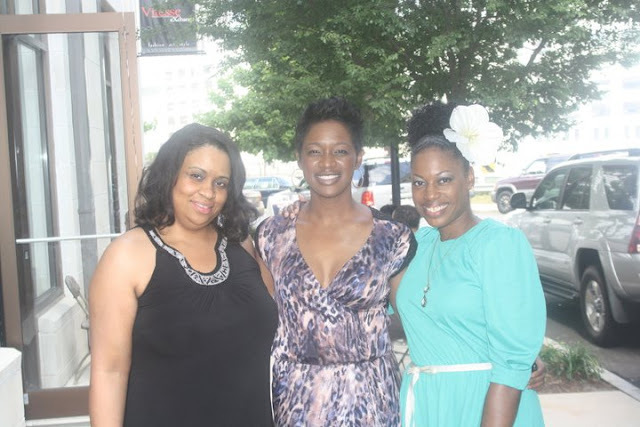 D.L.Winfrey, Me and Valaria SaRa at the Spring/Summer 2011 Swapnista Day Party. The unveiling of our new website. It will include more interactive tools for a pretty cool experience online and a way to connect our supporters from city to city. We will also unveil our charter class of PGRDress REP-STARS and provide an online application for women and girls who are interested in having a chapter in their city. We are partnering with some really cool businesses and bloggers to provide more events, information, services, and enlightenment. We also look forward to partnering with SWAPNISTA for more swap parties and entrepreneurial networking. Our new "We're PRETTY Sweet!" division will be launched. This is a venture sponsored by Carson Bryce Trading Company. Lastly, we plan to have more information geared towards our Pretty Dapper Fellas. We are celebrating our first anniversary next year and I am so excited! The new year will also bring about more PRETTY DEEDS because we are first and foremost a service organization. So as you can see, 2012 will be a huge year for PGRDresses! Like our Facebook Page, join the Facebook Group and Follow us on Twitter to join the movement! I have not participated in a link party in a while, so I jumped at the opportunity to rock my outerwear with the fashion bloggers of Detroit. I thrifted this blue cape a few months ago. It's extremely oversized but very cozy. I was determined to find one when I experienced a bit of thrift envy. I saw a fellow thrifter trying one on...I looked at her and thought to myself, "How did I miss out on that one." And my navy leather gloves are thrifted too. I think it's a perfect complement to my cape. Animal print leggings and black booties complete my look. This is how I Rock: Outwear! How do you? 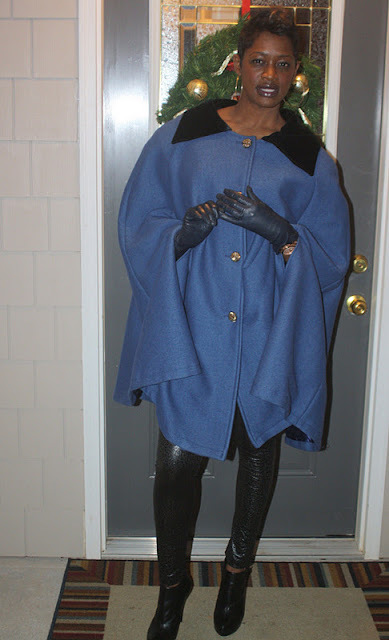 Be sure to check out how the ladies of Fash Det rock their outerwear too! I was so excited when I got the invite to attend the Sole Society Holiday Party hosted by The Fashionista Next Door. A holiday party means festive attire---my dress code had to include SEQUINS!! Here is closer look at what I wore. p.s My entire outfit is thrifted except my shoes and tights. 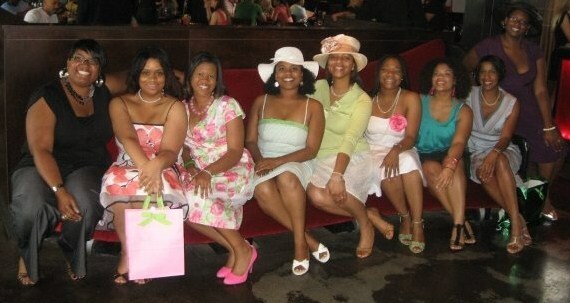 I had such a great time catching up with the Fashionable Atlanta blogging community. 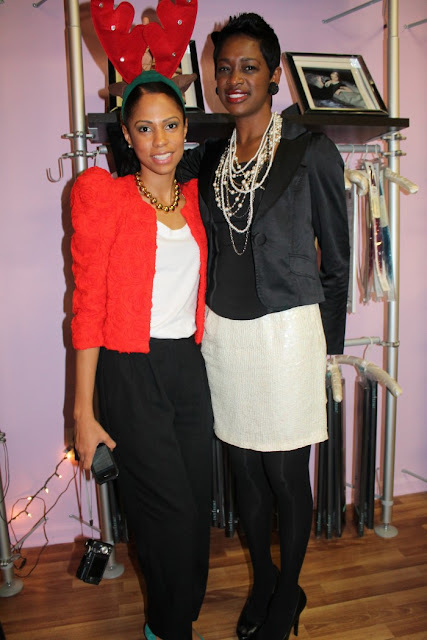 Our fabulous host Eboni of Fashionista Next Door and my favorite mommy blogger Trina of Baby Shopaholic. Our co-host Breck of Fashion Without Guilt. She was so festive sporting one of her many holiday themed hair accessories. I finally got a chance to meet Cath, one half of the twin blogging duo Asian Cajuns. She told me this was her last night in town because the next day she was heading to Paris to spend the holidays with her sister. How awesome is that!! The event was held at Sunny's Hair and Wigs. An upscale boutique that specializes in luxury hair extensions, wigs and accessories. Africa Miranda sharing some natural tips with Breck. I heart her hair...its simply fab! Our personal bartender served us from Clos du Bois and we indulged on delectable luxury chocolate from Vosges. Plus, Sole Society provided each of us with a FREE pair of shoes to add to our goodie bags. I chose the Bianca because of its gorgeous pink color. I can't wait to wear them. Maybe I will break them in for NYE. They are a definite welcome addition to my shoe collection. Thank you Eboni and Breck for planning and executing such a fun and festive event! And of course Sole Society for the fab shoes! For more pictures please visit my facebook page. 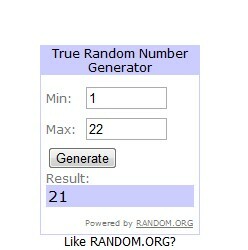 Thank you to everyone who participated in my Happy Hour Thrifting giveaway! This members only club is the perfect solution for women who may not have time (or patience) for thrifting, but would love to score fabuless fashion! There are three membership levels giving members access to exclusive discounts from our consignment, vintage and thrift partners. Additionally, members get up to 7 FREE must-have pieces each month by shopping our carefully curated online lookbooks or scheduling a shopping appointment at our private location. Kerrie and I are so proud to bring you our unique concept in resale shopping. 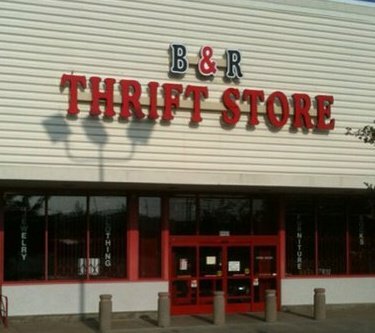 Happy Hour Thrifting is our way to share our love of thrifting and our talent of making thrifted fashion look stylish! So the winner of my giveaway of a FREE one-month membership to Happy Hour Thrifting ..... is comment #21 from Timmi of IStyleLLC! Congrats Timmi and welcome to our club! This weekend I had the pleasure of being one of the co-hosts of Mr. Goodwill Hunting's Launch Party for I Love Thrifting Day 2012. On Friday, we started the celebration at Goodwill Perimeter. Mr. GWH hosted an intimate style chat with shoppers. He shopped the store for pieces that were placed on a separate rack for customers to shop his choices. Atlanta Stylist, Virtuous Styls and Mr. GWH had an intense chat about thrifting for menswear. Another Atlanta thrifting diva, Fly Won also joined us for the evening. On Saturday, we headed over to B&R Thrift Store for the Launch Party & Fashion Show. The managers and staff of B & R always surprised us with their runway decor! We took a moment to welcome and thank our attendees for joining us for the event. La Lynns also won an I Love Thrifting T-Shirt. I Love Thrifting Day 2012 is Saturday, July 7, 2012. If you are in the Atlanta area, Virtuous Styls and I we will host a chartered bus tour of our favorite thrift store spots!! Details coming soon! Below are a few pictures from the fashion show. Fashion Without Guilt wearing bright colored denim with a classic button down top. The Little Black Dress is taken up a notch when paired with these hot pink suede booties. ....semi-formal. This was one of my favorite looks. The fashion show stylists walked the runway too. The gentlemen in the back are the Rebel Society . I can't wait to collaborate with them in the Spring for our next fashion show. Here is better picture of the styling team. Mr. GWH joined us for the finale shot too!! Our team of models and stylists worked really hard to pull of this fashion show. So please click HERE to see more pictures from the runway show!! Will you celebrate I Love Thrifting Day in your city?